The Kalikambal temple is in the heart of Chennai, in George Town. 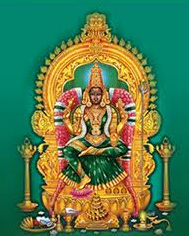 This temple enshrines Kalikambal (Kamakshi) and Kamateswarar and a host of other devatas. The history of the temple goes back to a few hundred years. It is said that the original location of this temple was closer to the sea shore and that it was relocated to its present location in 1640 AD during the period of British rule. The temple is said to have been built by the Viswakarma clan and they are said to be closely associated even to this date. Chatrapathi Sivaji worshipped Kalikambal when he visited Chennai on October 3rd 1677. He returned to his kingdom and won a battle. It is interesting to note that he came to be called as Chatrapathi after worshipping the deity. There are also icons of Ahora Veerabhadra Swamy and Mahakali. Icons of Karthikeyan with his consorts Valli and Devasena are also part of the celestial congregation. There are shrines dedicated to Nagaraja, Virat Viswa ParaBrahma. Gayathri Devi, Durga inside the temple. In the South western part of the temple Lord Annamalayar poses with his divine consort Unnamalayar. There is a separate enclosure for navagrahas. A shrine dedicated to Veera brahma Sankarar who is the kula guru -head of the Viswakarmar is present in the temple. There is also a shrine dedicated to Lord Kamateswarar. 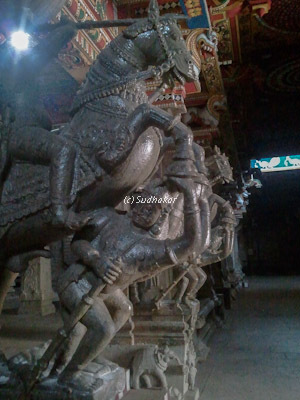 Other deities like Mahavishnu, Kala Bhairavar, Dakshinamurthi, Chandra and Surya are also seen in the temple. When the great Tamil poet,Subramanya Bharathiar used to work in the Swadesamithran magazine he made a ritualistic visit to the temple. He is supposed to have sung many songs here. Yathumakininrai kali is one such fine song. George Town is in the heart of the Chennai city well connected with Metro bus services, Suburban trains which terminates at the Beach station which is just a kilometer away from the temple. There are plenty of cycle rickshaws,auto rickshaws and taxis available near the temple. Where to Stay? There are several budget hotels in George Town area to super deluxe five star hotelsa a few kilometers away. Other interesting places around George Town; The high court is nearby, Burma bazar where you can get foreign goods, bazars dedicated to metals,hardware,stationery,pharma,electricals, garments are sold here at whole sale price.The famous Marina beach and the Chennai harbour is just a mile away from here.